The holidays are approaching fast and now it’s time to share all kind of sweet treats. Today I have some Pecan Caramel Truffles that are out of this world. This was originally going to be a recipe for energy bites, but I thought they were a bit too rich. Much better suited as a dessert. This healthy truffle recipe is a cinch to make and it will be a hit with anyone. It only took me a few minutes to whip up these Pecan Caramel Truffles. If you enjoy all things pecan and caramel, you will also like my pecan caramel ice cream and my cinnamon pecan cookies. 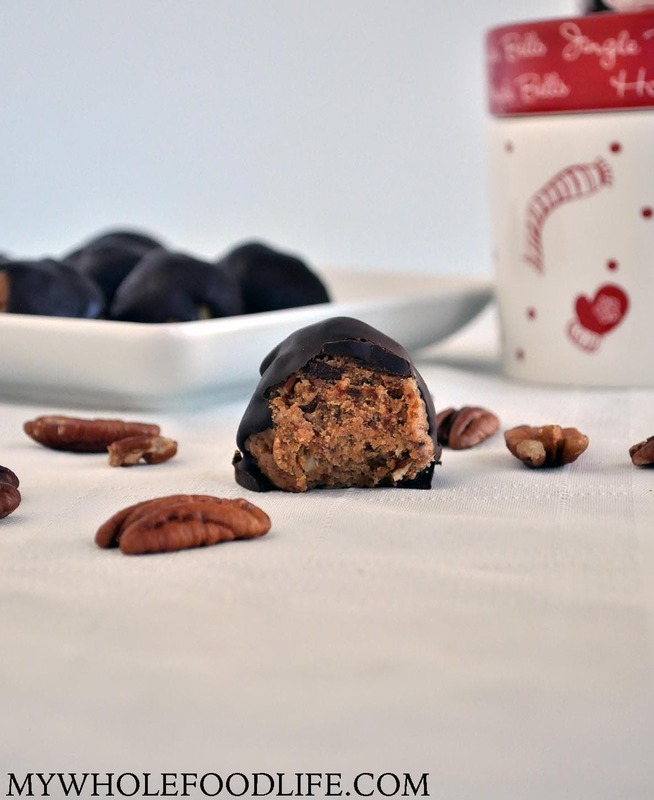 Just 5 ingredients to make these healthier pecan caramel truffles. In a food processor , combine the dates and cashew butter until smooth. Then add in the pecans and pulse a few times just to get them mixed through. You want to have some crunchy pieces in there. Roll into balls and place on a lined baking sheet . Place the baking sheet in the fridge while you make the chocolate. Melt the chocolate and coconut oil using a double boiler method. Once the chocolate is smooth, drizzle over the truffles and place them back in the fridge to firm up. It should only take about 30 minutes to firm back up. Keep these stored in the fridge or freezer. They should last a couple weeks in the fridge and months in the freezer. Enjoy! Thanks!! I LOVE cashew butter. OH-EM-GEE! These truffles look so indulgent and yummy! I love that you used dates (aka natures candy) for the caramel flavor! oooh these look super yummy!!! !